This graphic shows the working principle of a molecular pulley binder. Image: KAIST. Silicon anodes are receiving a great deal of attention from the battery community, as they are able to deliver capacities that are three to five times higher than those generated by the graphite anodes currently used in lithium-ion batteries. A higher capacity means longer battery use per charge, which is particularly important for extending the driving range of all-electric vehicles. Although silicon is abundant and cheap, silicon anodes have a major drawback: they can currently only last for a limited number of charge-discharge cycles, typically less than 100. This is because the microscopic silicon particles that make up the anode expand enormously during each charge-discharge cycle, leading them to disintegrate and thus reducing the battery’s capacity. 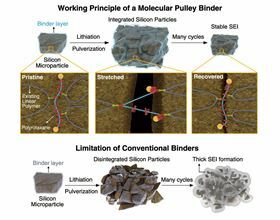 In a paper in Science, a research team at the Korea Advanced Institute of Science and Technology (KAIST) in Daejeon, led by Jang Wook Choi and Ali Coskun, has now reported using a molecular pulley binder to create high-capacity silicon anodes for use in lithium-ion batteries. The KAIST team integrated molecular pulleys, called polyrotaxanes, into a battery electrode binder, a polymer used in battery electrodes to attach the electrodes onto metallic substrates. A polyrotaxane comprises molecular rings threaded onto a polymer backbone, with these rings able to move freely along the backbone. The movement of the rings in polyrotaxanes can match the volume changes of the silicon particles, preventing the particles from disintegrating during their continuous volume change. The high elasticity of the polyrotaxane binder ensures they can hold together even pulverized silicon particles. The functionality of the new binders is in sharp contrast to existing binders (usually simple linear polymers) that possess limited elasticity and so are not capable of holding pulverized particles together. These binders allowed the pulverized particles to break apart, causing the silicon anode to degrade and lose its capacity. "This is a good example of showing the importance of fundamental research," said the authors. "Polyrotaxane received a Nobel Prize last year, based on the concept called 'mechanical bond.' The 'mechanical bond' is a newly identified concept, and can be added to classical chemical bonds in chemistry, such as covalent, ionic, coordination and metallic bonds. The long fundamental study is now expanding in an unexpected direction that addresses longstanding challenges in battery technology." The authors also mentioned that they are currently collaborating with a major battery maker to get their molecular pulleys integrated into real battery products. "Mechanical bonds have come to the rescue for the first time in an energy storage context," commented Sir Fraser Stoddart of Northwestern University, the 2016 Noble Laureate in Chemistry. "KAIST team's ingenious use of mechanical bonds in slide-ring polyrotaxanes – based on polyethylene glycol threaded with functionalized alpha-cyclodextrin rings – marks a breakthrough in the performance of marketable lithium-ion batteries. This important technological advance provides yet more evidence that when pulley-like polymers carrying mechanical bonds displace conventional materials based on chemical bonds alone, the unique influence of this physical bond on the properties of materials and the performance of devices can be profound and game-changing." This story is adapted from material from KAIST, with editorial changes made by Materials Today. The views expressed in this article do not necessarily represent those of Elsevier. Link to original source. Scientists have quadrupled the capacity of the anode in lithium-ion batteries by simply replacing graphite with silicon. Download the article, sponsored by Zeiss, now.